Minimalist living in a tiny home is quite common for a couple, but when designing a compact space for a family of four (plus a fur baby), strategic planning is essential. 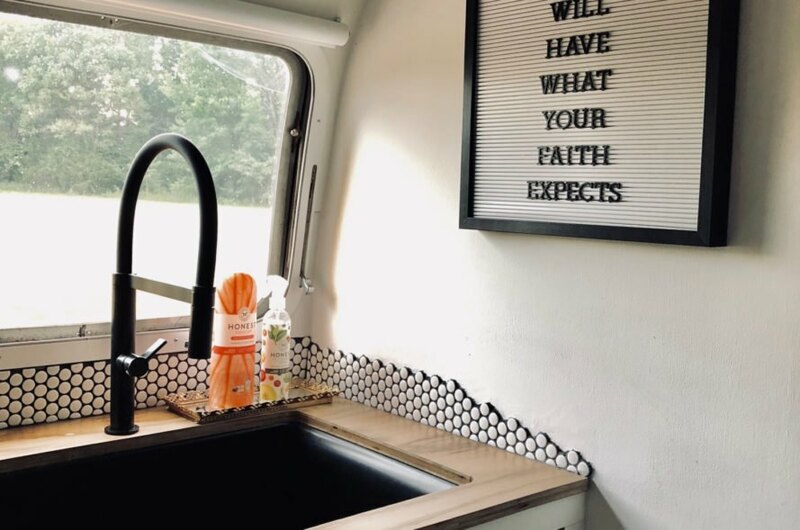 When Colleen and Zachary Cashio purchased a 1972 Airstream trailer that was just 31 feet long, they knew they had a big renovation project on their hands, but they took it head on with some impressive DIY skills. Today, the Steady Streamin’ Cashios is a space-efficient, sophisticated home, which was handcrafted to meet the needs of the family. At one time, the Cashio family was following the path toward the “American Dream” when they had a revelation — they needed to simplify. The couple realized that they wanted to teach their two kids about the importance of enjoying life and experiences without the distractions of material things. The big chance to renovate their lifestyle came in the form of a 1972 Airstream Sovereign. 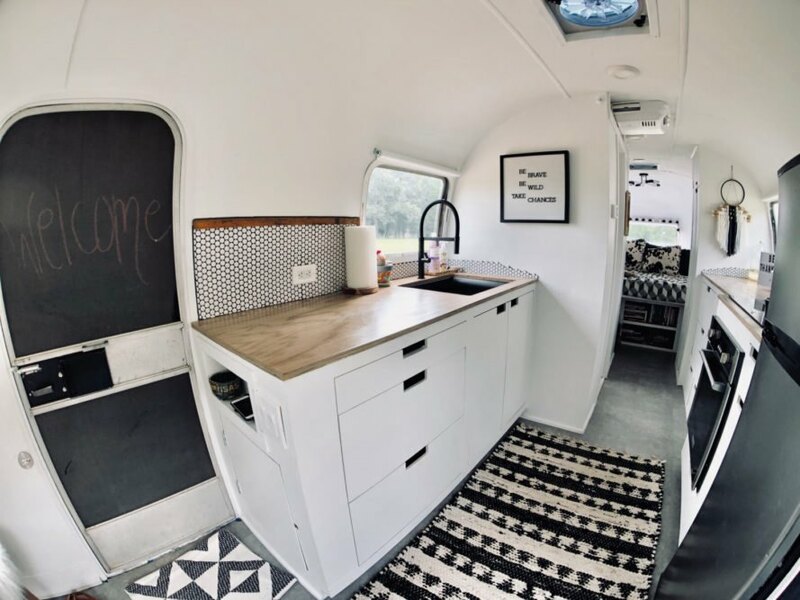 Naturally gifted in the DIY department, the ambitious couple did all of the work on the Airstream conversion themselves. After buying the trailer, they gutted the interior and started with a hollowed-out shell. In the process, they did find a few structural issues, but they were able to take off the shell and fix some of these problems thanks to Zach’s welding skills. 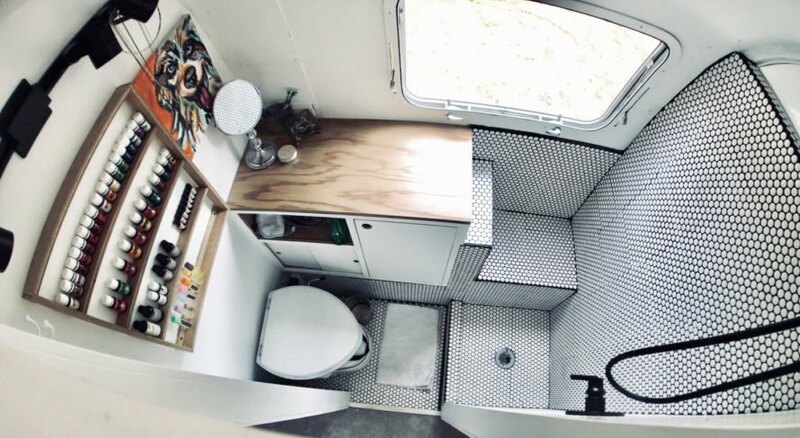 The trailer was then outfitted with a new electrical system (thanks to Colleen’s father and father-in-law) with LED lighting, new ultra-efficient windows and an elastomeric reflective rooftop coating to insulate and cool off the Airstream’s interior. Once the basics were all in place, they began to layout the design of their new living space. They decided to go with a black and white color scheme that added a contemporary feel to the living space. All-white walls and natural light open up the compact space, and strategic storage was installed wherever possible to curb clutter. The living space is light and airy with a sofa nested into the curved shape of the trailer. The sofa has ample storage underneath for kids toys, magazines and more. The kitchen, which is quite large for a tiny home of this size, was installed with a black and white backsplash and wooden countertops to add a modern touch. The bedroom, which fits a king-sized bed, is located past the kitchen and bathroom. 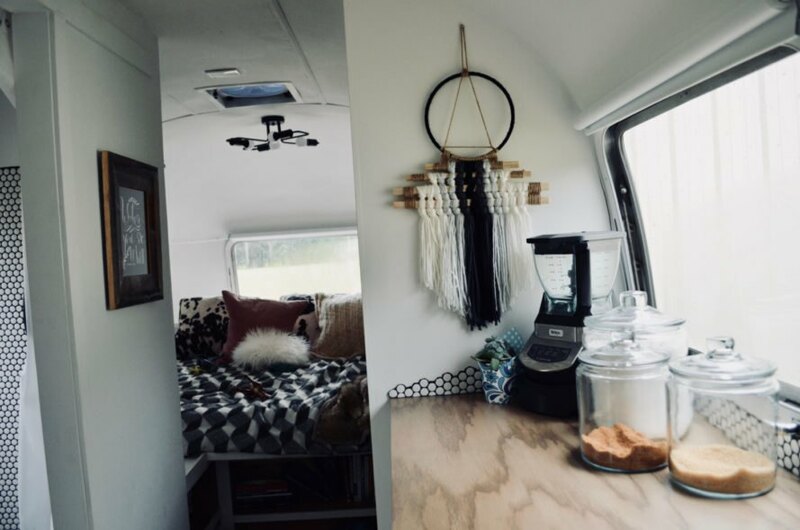 You can follow the family’s journey in their sleek, minimalist Airstream home on their website or Instagram. 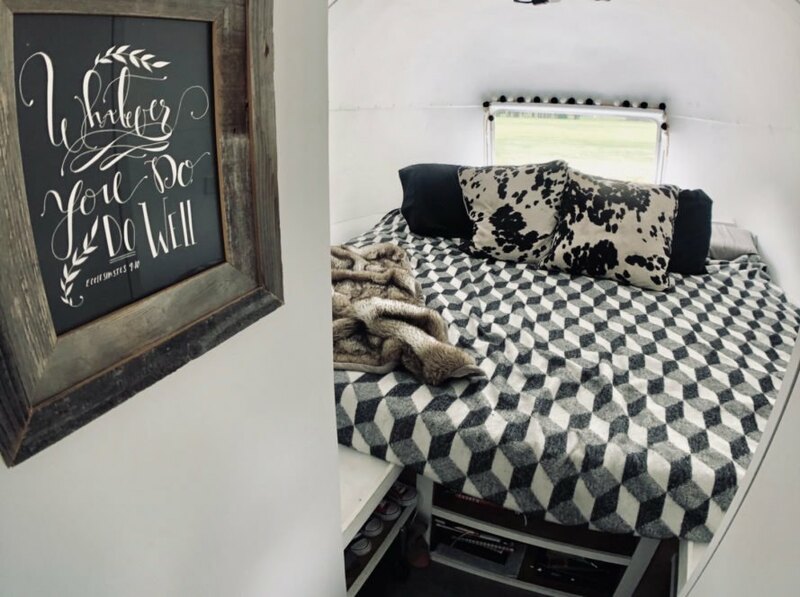 Colleen and Zachary Cashio transformed an old Airstream into their dream home on wheels. The interior space was outfitted with ample storage space to avoid clutter. The couple, with some help from family, did all of the work themselves. Natural light floods the interior space. A minimalist design scheme was used throughout the interior. The bathroom includes plenty of storage for the family. The bedroom is big enough for a king-sized bed. The couple installed new windows to improve insulation.